The Rockford IceHogs introduced the Rock River Valley to professional hockey in 1999. The IceHogs, as members of the United Hockey League, played its first game on Oct. 15, 1999, against the Knoxville Speed at the Rockford MetroCentre. The IceHogs won their first ever game 6-2 over the Speed led by Brant Blackned’s hat-trick. Rockford was led by Head Coach Dale DeGray for its first two seasons. 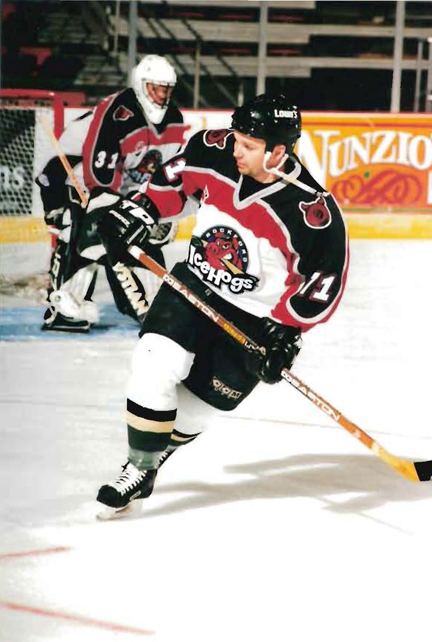 After leading the IceHogs for two seasons, DeGray was replaced by Scott Bell behind the IceHogs bench in 2001-02. Bell led Rockford for a season-and-a-half, before Scott Burfoot took the reins and led Rockford into the postseason for just the second time club history. 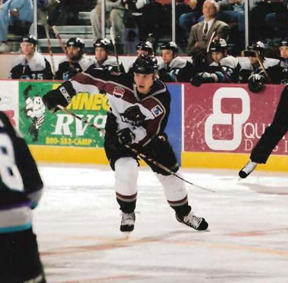 Burfoot also played in three games for Rockford in 2002-03 before getting named head coach. 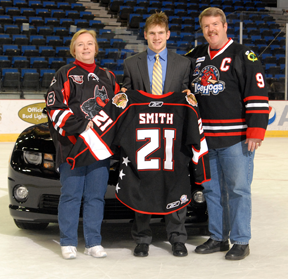 Following the 2004-05 season, Tumilowicz announced that he had bought out McIlroy and Smith and that he added Craig Drektrah to the IceHogs’ ownership group. Haviland would guide the IceHogs to a 44-26-4-6 record in the team’s first AHL season, qualifying the club for the Calder Cup Playoffs. Rockford defeated the Houston Aeros 4-1 in the best-of-seven West Division Semifinals series. The lone loss was a 1-0 double overtime defeat, the longest scoreless hockey game in AHL history as Ryan Jones scored on Corey Crawford after 86:57 of scoreless hockey at the MetroCentre. In their first AHL season, Rockford would come up short in the West Division Finals against their new-found rivals, the Chicago Wolves. After Rockford grabbed a 3-2 series lead in the best-of-seven set, the Wolves would grab wins in Games 6 and 7 to win the series en route to their second Calder Cup Championship. 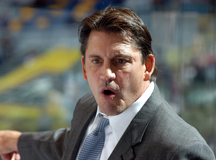 On August 1, 2008 Bill Peters was named the eighth Head Coach in club history and second during the team’s AHL era. Rockford would go onto to qualify for the Calder Cup Playoffs in each of Peters first two seasons, stretching the seasons of postseason hockey to six straight in the Forest City. During that six season stretch, the team won at least 40 games each year. After bowing out of the playoffs in the first round in 2009 and 2010, the IceHogs would miss the postseason all together for the first time in six years in 2011. Despite missing the playoffs in 2010-11, Rockford finished the campaign with a record of 38-33-4-5. The 2012-13 season began with the NHL lockout, putting six Blackhawks skaters in Rockford for the first-half of the campaign. After the lockout ended, Rockford would finish '12-13 as one of the hottest teams in the AHL, but fell one win shy of the Calder Cup Playoffs. In doing so, the IceHogs became the first team in the 77-year history of the AHL to win 42 games in the regular season. Center Brandon Pirri became the first player in IceHogs history to lead the league in scoring as he paced the AHL with 75 points, including 22g-53a. After another successful season in 2013-14 which saw the IceHogs finish above .500 for the 10th straight season, the Hogs also set an all-time attendance record with 182,540 fans visiting the BMO Harris Bank Center for 38 home games. Overall, 61 different IceHogs skaters have appeared in the NHL, including 48 with the Blackhawks. The list includes 10 players who were members of the 2010 Stanley Cup Champion Blackhawks team including Bryan Bickell, Dave Bolland, Nick Boynton, Troy Brouwer, Dustin Byfuglien, Colin Fraser, Jordan Hendry, Niklas Hjalmarsson, Antti Niemi and Kris Versteeg. 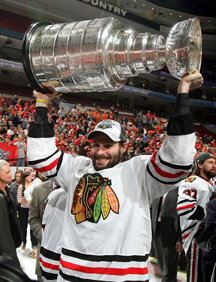 When the Blackhawks won the Stanley Cup again in 2013, another 10 members were former IceHogs, including Bickell, Bolland, Brandon Bollig, Corey Crawford, Hjalmarsson, Marcus Kruger, Nick Leddy, Brandon Saad, Andrew Shaw and Ben Smith. The first player to use Rockford as a launching pad to the NHL was winger Raitis Ivanans. 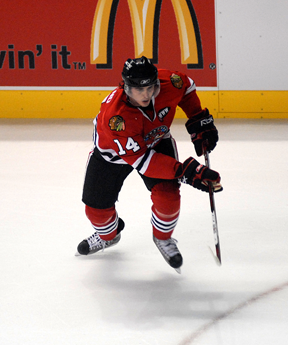 Ivanans played with the IceHogs during the 2002-03 season and for one-game in 2003-04. The rugged winger made his NHL debut with the Montreal Canadians in October 2006. Ivanans has also played with the Los Angeles Kings and Calgary Flames in the NHL. An annual charity jersey auction has helped the IceHogs raise over $725,000 that benefits local non-profit charity organizations in the Rockford area. The team, including players, coaches, front office members and mascots Hammy and Hammer Hog, made 186 community appearances in 2013-14. The IceHogs inked a 10-year affiliation agreement with the Chicago Blackhawks on on March 19, 2007. Raitis Ivanans was the first former IceHogs player to play in the NHL. The rugged winger has played for the Montreal Candians, Los Angeles Kings and Calgary Flames. The IceHogs hold an Annual Jersey Auction each season and the event has helped raise over $729,000 during the first 15 years for local charities. 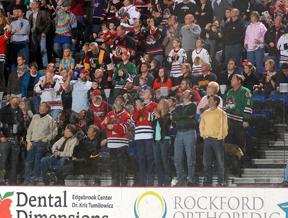 The IceHogs set a franchise attendance record in 2010-11 average 4,360 fans during the team's 40-game home schedule. It marked the first time that Rockford averaged over 4,000 fans per game for an entire season.